Small Animal Pelvic Radiography (Jan/Feb 2012). Ligamentous instability secondary to cranial cruciate injury. High-quality, correctly positioned radiographs are required in order to provide accurate assessment of the osseous and soft tissue structures of the stifle joint. This becomes even more critical when corrective osteotomies that alter joint alignment (tibial plateau leveling osteotomy or tibial tuberosity advancement) are performed. The standard of care in small animal veterinary medicine for stifle radiographic series should include straight mediolateral and caudocranial views. Following a consistent, repeatable technique for obtaining stifle radiographs helps optimize the quality of the images. The stifle joint is one of the most common orthopedic radiographic studies. 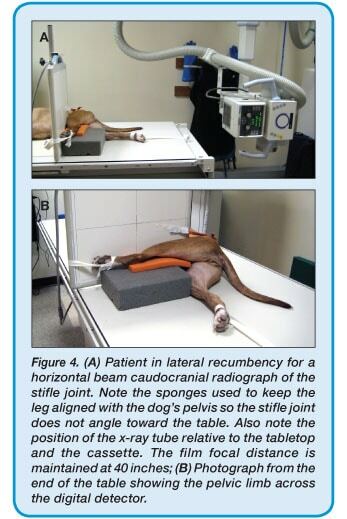 In addition to discussing new radiographic techniques for evaluation of dogs with stifle disease, this article also covers stifle anatomy, radiographic positioning, image formation, and quality control. Four sesamoid bones, including the patella, fabellae of the origin of the lateral and medial gastrocnemius muscles, and fabella of the insertion of the popliteus muscle. The patella normally articulates with the trochlear groove of the cranial distal surface of the femur. There are two femoral condyles (medial and lateral) that articulate with the medial and lateral menisci, two c-shaped fibrocartilage structures that cover the tibial condyle and alleviate the incongruity between the two surfaces. The femoral and tibial condyles barely directly articulate in the normal stifle because of the menisci. The fibular head forms a fibrous connective tissue joint with the proximal aspect of the lateral proximal tibia. The fibula is a lateral anatomic structure and the tibia is located in a medial anatomic position. The lateral fabella (sesamoid) of the origin of the head of the gastrocnemius muscle is elongated in a proximal to distal direction compared with the medial fabella. 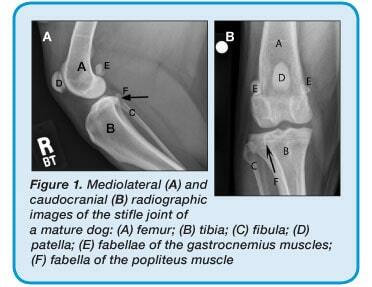 Both fabellae are located at the proximal, caudal margin of the femoral condyles. The popliteal sesamoid is located along the medial aspect of the caudal proximal margin of the tibial condyle. The technique used for an average weight, medium to large dog is 60 kVP and 3 mAs for a lateral projection and 66 kVP and 3 mAs for a caudal cranial projection, with the stifle placed directly on the cassette or detector (no grid used). To set the technique for a lateral projection, measure the stifle at the level of the femoral condyles in the medial to lateral plane. For the caudal to cranial stifle projection, measure the level of the distal femur in the caudal to cranial plane. The cranial caudal measurement will be larger than the medial lateral measurement for most dogs and cats. For a mediolateral image of the right or left stifle joint, the patient is positioned on the table in lateral recumbency with the side to be radiographed closest to the table and marked with a lead marker in the collimated area as right (R) or left (L). This radiopaque marker is placed along the cranial aspect of the limb and should not be superimposed over any anatomic structure (Figure 2). The thoracic limbs should be taped together and pulled cranially to assist with restraint and ensure lateral position of the body. Place a small sponge under the dorsal aspect of the pelvis to help the femoral condyles remain superimposed over each other in the proximal to distal direction. The pelvic limb not being radiographed is taped so it is abducted away from the stifle being radiographed. This is accomplished by taping around the stifle and tarsus and securing the tape to the table. If severe degenerative joint disease of the coxofemoral joints is present, the leg may be pulled forward and taped to the table. A small sponge may need to be placed under the plantar surface of the tarsus to rotate the stifle; this will assist in aligning the femoral condyles in the cranial to caudal direction. Palpate the epicondyles of the femur and place the center of the collimator light at this point. Collimate so the field of view (FOV) includes the distal third of the femur and the proximal third of the tibia. It is also important to include all of the soft tissues cranial to caudal to the pelvic limb at the level of the stifle joint. Caudally, it is imperative to visualize the fascial stripe that normally runs in a proximal to distal direction along the caudal aspect of the joint as well as the soft tissue musculature and popliteal lymph node. Caudal displacement of this fascial stripe can be indicative of stifle joint effusion and/or capsular thickening. Cranially, the collimated FOV should include the skin margin and the patellar ligament along the inside of the skin margin (thin soft tissue ligament seen extending from the distal margin of the patella to the cranial and proximal tibial tuberosity). When technique is correct, the skin margin and patellar ligament will be easily visualized along the cranial aspect of the stifle joint (Figure 1A). For the orthogonal view, the stifle should be imaged in a caudal to cranial or cranial to caudal direction. The caudal to cranial projection will place the stifle joint nearest to the radiographic cassette or digital detector, reducing image magnification and potential geometric distortion. A vertical or horizontal beam radiograph can be made; however, the ability to take horizontal beam images will be constrained by the machine being used. In all cases, the radiopaque ID marker (R or L) should be placed along the lateral aspect of the stifle joint, avoiding superimposition over any structures being radiographed. This technique works well for smaller dogs and cats. 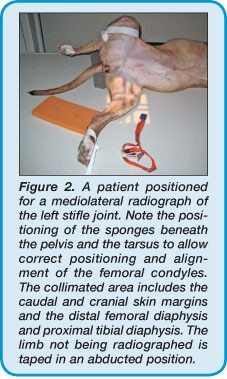 The patient can be placed in ventral (sternal) recumbency with the pelvic limbs pulled caudally, placing the affected stifle in the center of the cassette/detector (Figure 3A). The patient can be placed in a V-trough to help keep the thorax and pelvis straight. The x-ray tube head is then angled toward the pes (pelvic limb distal extremity) with the center of the x-ray beam at the level of the junction between the thigh and crural musculature (Figure 3B). This positioning may not be possible in dogs with severe hip dysplasia, trauma, or degenerative changes of the lumbar or lumbosacral spine without heavy sedation or general anesthesia. NOTE: This positioning results in the greatest degree of magnification and geometric distortion due to the distance between the stifle joint and the cassette/detector. The patient is placed in dorsal recumbency as if positioning for a pelvic ventrodorsal radiograph. The pelvic limbs are extended to position the stifle joint as close as possible to the tabletop or imaging cassette/digital detector. The x-ray tube head is not angled; instead, it is positioned perpendicular to the tabletop as routinely used for vertical beam radiography. This technique works well for medium- to large-breed dogs. The patient is placed in lateral recumbency with the stifle joint to be imaged in a nondependent position away from the table. The affected limb is placed on sponges and pulled distally so that the limb is straight and parallel with the tabletop, being perpendicular to the pelvis. The cassette/detector is then placed along the cranial aspect of the limb and secured to allow the radiographer to leave during exposure. For the ventrally recumbent patient (Figure 3), palpate the femoral epicondyles at the level of the stifle joint and place the center (cross hairs) of the collimator light at this point. Collimate so that the FOV includes the distal third of the femur and the proximal third of the tibia. 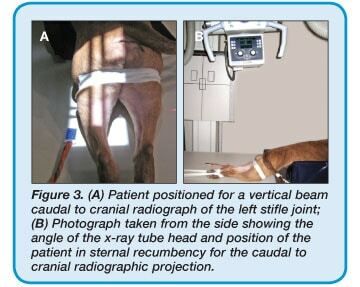 The x-ray tube head should be rotated approximately 5 to 10 degrees caudally (angle light from caudal to cranial as seen from the dog) to prevent superimposition of the femur and tibia at the level of the stifle joint. The tube angle is dependent on the muscle mass of the dog when the limb is in an extended position. For the laterally recumbent patient (Figure 4), the x-ray tube head is rotated 90 degrees, positioning it parallel with the tabletop and perpendicular to the pelvic limb being radiographed. The x-ray beam is centered on the femoral condyles, with the horizontal line of the collimator light cross hair positioned midline with the femur/tibia. Collimate to include the distal third of the femur and the proximal third of the tibia. All bones should be sharply margined and clearly visualized. Enough x-ray penetration should be present to clearly expose the normal cancellous (intramedullary) bone pattern of the distal femur and proximal tibia. However, the exposure should not be so great that the soft tissues are overexposed and not visualized in the final image. Soft tissues, including the musculature and popliteal lymph node along with the cranial and caudal skin margins. Is the positioning lateral and straight? In a straight mediolateral image, the femoral condyles should be superimposed over each other and the fibular head should be in a caudal position along the proximal portion of the tibial condyle. On the caudocranial image, the patella should be in a central position, with no overlap between the femoral condyles and the tibial condyle. The femoral condyles should be equal in size and shape. The tibial plateau leveling osteotomy (TPLO) lateral is a special projection. Its purpose is to position the proximal tibia where the proximal tibial joint surface is highlighted. This allows the surgeon to consistently and repeatedly determine joint orientation in order to quantitate the tibial slope. This assessment is then used to plan the osteotomy that will be performed during surgery (Figure 5). The mediolateral projection includes the crus (tibia and fibula) from the stifle joint (distal femoral diaphysis) distal to the proximal metatarsus. Both the stifle and tarsal joints are flexed at a 90-degree angle. The center of the collimator light should be placed just distal to the center of the stifle joint (proximal third). This will allow medial and lateral tibial condyle margin imposition. The intercondylar eminences need to be superimposed in proximal to distal and cranial to caudal directions. However, due to the anatomy of the femur in some dogs, the intercondylar eminences may be superimposed while the femoral condyles are not. For the purpose of surgical measurements, it is more important for this view to have the intercondylar eminences superimposed rather than the femoral condyles. The caudocranial projection should include the distal femur, entire stifle joint, and crus and extend distal to the level of the proximal metatarsi. The femoral condyles should appear equal in size on the image. The patella should be superimposed centrally between the femoral condyles and at a mid position relative to the femoral condyles. 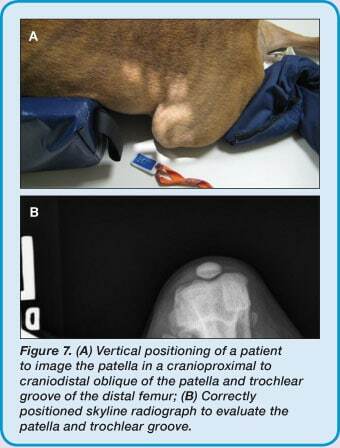 This may not be the case if the dog has patellar luxation (Figure 1). The tibial tuberosity advancement (TTA) procedure is also used for the surgical repair of cranial cruciate ligament rupture. 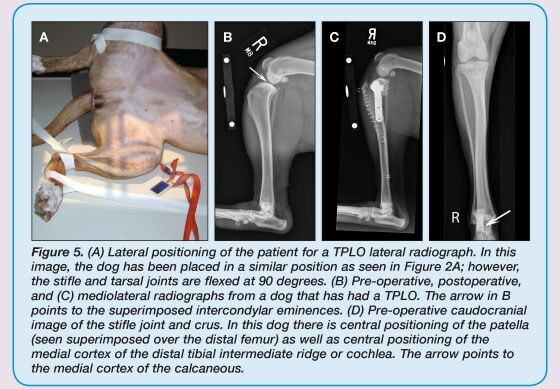 The mediolateral radiograph projection for the TTA differs from the TPLO mediolateral projection in that the femur and tibia are not flexed but remain in a more natural extended position (Figure 6). Correct positioning for the TTA image will be determined by stifle joint laterality and angle of the femur and tibia. The femoral condyles should be superimposed as with a mediolateral stifle view. Using an externally placed goniometer, the stifle joint angle should measure 135 degrees (Figure 6). The caudocranial TTA projection should include the distal femur through the proximal metatarsal bones. The patella should be superimposed centrally between the femoral condyles, which are normally equal in size. For the lateral TTA projection, the center of collimator light should be at the center of the stifle joint, with the FOV opened to include as much of the femur and tibia as possible and the stifle joint angle at a 135-degree angle. The skyline patella radiographic projection is used to better visualize the patella and trochlear groove (Figure 7). This view is typically used in cases of medial or lateral luxating patella. As with the caudocranial view of the stifle, there are two approaches to positioning based on a horizontal or vertical position of the x-ray tube. The patient is positioned in ventral recumbency with the affected limb flexed and pushed cranial and lateral. The tibia is positioned under the femur with the affected stifle centered in the middle of the cassette/detector. A sponge is placed between the body wall and femur to help push the stifle joint away from the body. The patient can be placed in a v-trough for stability and to help keep the thorax straight. With the patient in ventral recumbency and the stifle joint flexed, palpate the distal femur and patella. The center of the collimator light is positioned at this level (distal femur). The FOV should include the distal portion of the femur. If possible, the x-ray tube should be rotated approximately 5 degrees cranial (toward the animal’s head) to prevent superimposition of the patella, femur, and tibia. This view would then be termed a cranioproximal to craniodistal oblique projection of the patella or distal femur. The patient is positioned in dorsal recumbency using a V-trough; the pelvic limbs are flexed. The x-ray tube is rotated 90 degrees and placed in a horizontal position, situating the patella perpendicular to the cassette and x-ray tube head. A sandbag is placed over the tarsus and pes for stabilization. The cassette/detector is then placed on the abdomen just cranial to the stifles and secured for exposure. With the patient in dorsal recumbency, the tube head is rotated 90 degrees toward the affected limb. The center of the beam is focused at the patellar level. The patella with a small portion of the femur should be included. Due to varying thickness of the limb, keep the collimation of the skyline FOV of the patella to as small an area as possible, which reduces secondary radiation. Although not required, sedation is recommended for any orthopedic radiographic study as it allows the patient to relax, thereby allowing easier positioning (particularly extension for cranial caudal images). In addition, sedation also decreases the amount of time required for repositioning due to lack of patient cooperation. For animals with painful joints, a neuroleptanalgesic protocol provides both sedation and pain control. Dismukes DI, Tomlinson JL, Fox DB, et al. 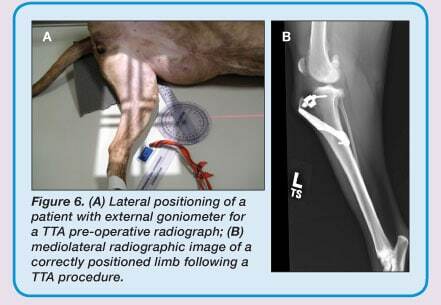 Radiographic measurement of canine tibial angles in the sagittal plane. Vet Surg 2008, 37: 300-305. Dismukes DI, Tomlinson JL, Fox DB, et al. Radiographic measurement of the proximal and distal mechanical joint angles in the canine tibia. Vet Surg 2007; 36:699-704. Lambert RJ, Wendelburg KL. Determination of the mechanical medial proximal tibial angle using a tangential radiographic technique. Vet Surg 2010; 39:181-186.